In contrast to other members of the Drosophila family, the spotted-wing fly D. suzukii deposits its eggs in ripe fruits. LMU biologists have now elucidated the sensory basis of their ability to exploit a novel ecological niche. Unlike most species of the genus Drosophila, which deposit their eggs in fermenting fruits, the so-called spotted-wing Drosophila, D. suzukii, lays its eggs in ripe fruits. 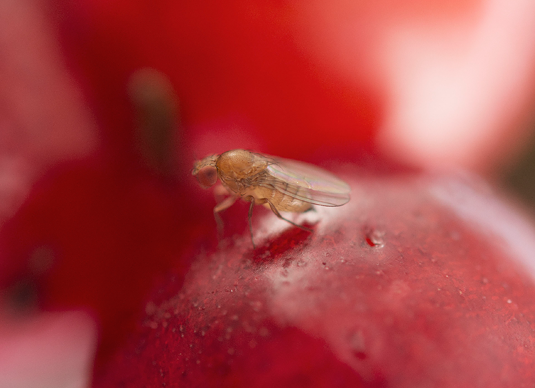 This apparently minor difference in behavior can have catastrophic consequences for commercial fruit-growers, and has made the species into a crop pest. For the puncture made by the female’s ovipositor facilitates infections, while the hatched larvae feed on the fruit pulp. As a result, these infestations cause enormous damage to soft-fruit crops, such as cherries, raspberries, grapes and strawberries. LMU biologists led by Professor Nicolas Gompel, in a collaboration with the groups of Dr. Benjamin Prud’homme (CNRS, France) and Professor Ilona Grunwald Kadow (Technical University, Munich), have begun to explore the genetic basis for this unusual egg-laying behavior. Their findings appear in the latest issue of the journal Current Biology.